Southcentral Kodiak Island, including southern Uyak Bay from south of Alf Islands to the head of Uyak Bay. Area map (Image file 76 kB). Uyak Bay is a deep fjord that cuts most of the way through Kodiak. The sides are steep mountainous terrain with dense alder thickets. Large tidal flats are located at the head of the bay with grasslands and extensive cottonwoods groves. Drainages along the western side of the bay are steeper and support less abundant populations of salmon than the drainages at the head and on the northeastern side of the bay. Alpine areas begin at about 1500' and range from extremely rugged peaks with permanent snowfields to flat to steep areas with a number of small ponds. 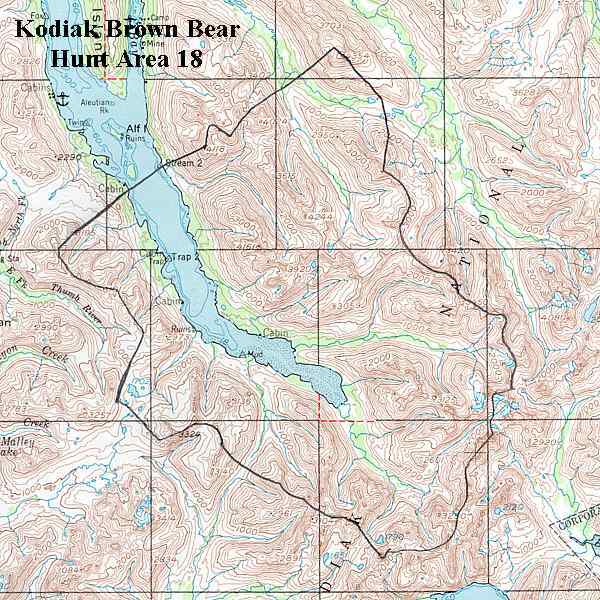 Primarily Kodiak National Wildlife Refuge lands, with some Koniag Inc. lands along the northern portion of the bay.